1.High Quality Ultra Flexible Soft Silicone Rubber Copper Wire! Super Low Impedance,Highly Efficient! 2.High strand count copper core,28awg silicone stranded wire has 16 strands 0.08 mm tinned copper wire,the copper strands are tinned,protecting them from corrosion and making it easier to solder. 3.They are constructed with premium silicone rubber insulation.High temperature resistance 200 degree C,Low temperature resistance,in extreme cold -60 degree C.Rated Voltage:600 volts.Outside diameter 1.2 mm,tolerance +/- 0.1 mm. 4.28 gauge silicone wire kit:10 colors,red black blue white yellow green orange pink purple and brown,each color 10 ft,total 100 feet. 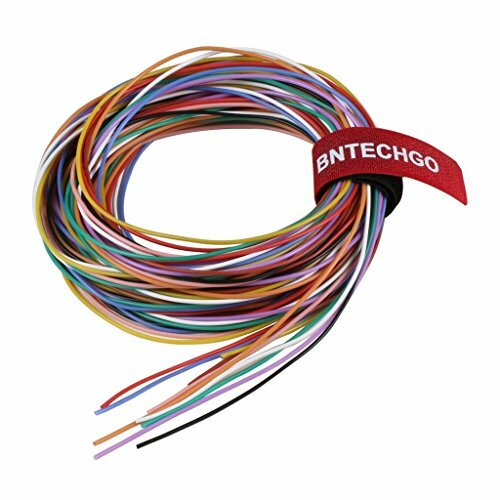 5.BNTECHGO silicone wire are widely used for model planes,model cars,model ships,batteries,lamps,household appliances,electric heating appliances,meters,instruments,motor lead wire and digital fields.